Nowadays, there are many different startups and established enterprises operating in the crypto market. To stand out, they need to offer their customers a product which can improve users experience. Changelly’s API is the perfect tool for that and here are the reasons why. The main reason why more than 250+ partners have already chosen Changelly’s API is its simplicity and usability. Crypto market is growing rapidly and its standards are rising as well. To be among market leaders you have to provide your customer with an opportunity to purchase your token with other assets within the platform interface. 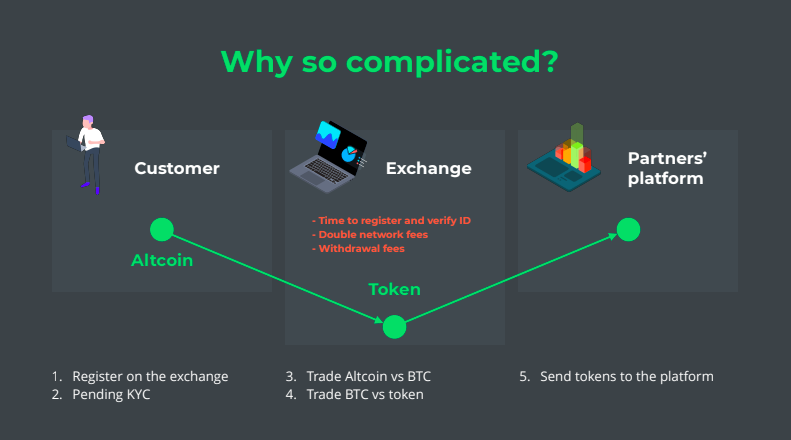 In most cases, in order to exchange crypto, a user would have to set-up an account on a Cryptocurrency Exchange followed by providing personal data, then wait for account approval, fund the account, trade the start asset for BTC, then trade BTC for the needed asset and finally send it to the destination wallet. As you can see this chain is long and full of activities. One should be a huge fan of your platform and its token to be willing to purchase it in such a challenging way. 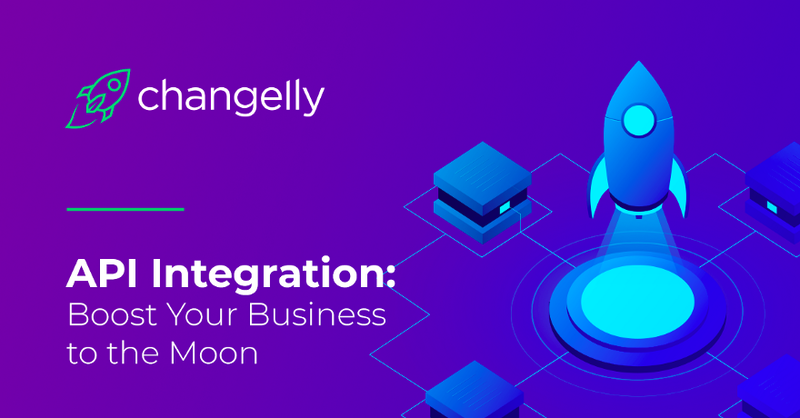 At the same time, Changelly’s API integration provides crypto enthusiasts with a tool that helps them get around various pitfalls of the industry. Our API will save your customers a lot of time, effort and withdrawal fees. 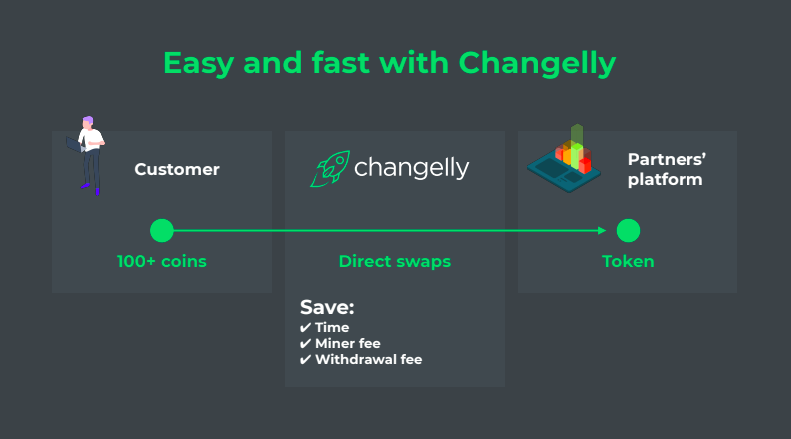 Changelly swap process is smooth and seamless: the user only needs to provide the receiving address and wait for the coin transfer. Depending on the network speed the whole process may take from 5 up to 30 minutes. There is a vast variety of services, offering different solutions for those involved in the crypto industry, and almost every service has its own token, which can be confusing for the user entering the crypto space. That often confuses a person who wants to enter cryptomarket. To address this issue, Changelly provides different businesses with an outstanding painkilling option to top up their service with 100+ cryptocurrencies. Now, your customer won’t need to go to the exchange in order to buy your token and then come back to your platform. Thanks to Changelly’s API the user will be able to instantly swap dozens of assets into your token directly inside your product! This is a great instrument for mass adoption of crypto, as it is extremely user-friendly and convenient. Moreover, API integration is one of the main requirements for getting your token listed on Changelly. Once the listing process is complete, you will become a part of our ecosystem, and your token — a handy tool for the exchange on other partners’ platforms! API is an extremely handy tool not only for those who want to swap cryptos but also for those who want to buy and hold it. Thus, Changelly’s API can be used as a payment solution in different decentralized marketplaces. One of the examples is Blockmarket, which is a prominent crypto marketplace that works with Changelly’s API. The marketplace has its native SYS token and works similarly to eBay, so you can buy goods there for SYS. The API integration enables the conversion of any coin supported by Changelly into SYS in a seamless way. Thus, the API payment option allows the Blockmarket users to buy any goods for SYS and gives extraordinary benefits to the Blockmarket product team. API allows you to set your own fees! Whether you want to use 0.5% or 2%, you will get that commission for every transaction made on your platform. It’s your business and only you decide how much to earn. Now that you’ve decided to implement our API, you need to know more about the technical aspect of it. Integrating Changelly’s API is an extremely easy and smooth process thanks to our developers standing ready to answer all your questions. In the letter provide us with basic information about your project: name, website, approximate date of launch, stage of development and some ideas on how your platform would benefit from our API. Afterward, you can start integrating the code into your backend with instructions, which you will find here. Also, you are welcome to check out our code examples at GitHub. In case you would like to know more about our API, feel free to contact our team at [email protected] so they can lead you through the process. More information about all the benefits of our API integration you can find here.